The Laboratory of Farm Mechanization was founded in 1995. It covers the student education as well the research on farm mechanization. It covers the description, design, construction and testing, use by the farmer and management of machinery and equipment used in crop and animal production as well as in the first processing of the products at the farm level. 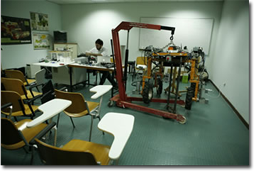 The laboratory covers a wide range of applications of the Mechanical Engineering in Agriculture. It covers basic engineering subjects like mechanics, material properties and strength, soil mechanics, manufacturing tools, internal combustion engines, machinery and equipment used in farm work as well as their management. The laboratory facilities are located in the main building in Fytoko and in the Velestino Farm. The laboratory has developed different sections dealing with specific part of the research and education activities which are described in the following. A small workshop covers the basic need of the laboratory for light constructions. The existing facilities are divided in sections. ΠΕΡΙΦΕΡΕΙΑΚΟΣ ΠΟΛΟΣ ΚΑΙΝΟΤΟΜΙΑΣ ΘΕΣΣΑΛΙΑΣ "Παραγωγή Βιοκαυσίμων στην Θεσσαλία"